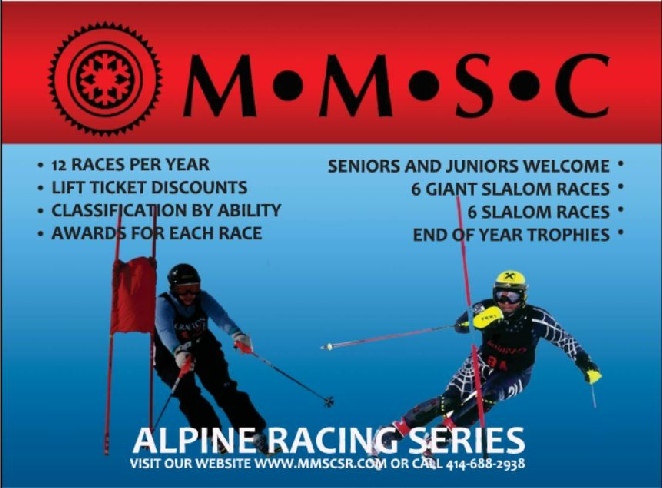 MMSC is a council of Alpine Race teams from around the Milwaukee Wisconsin area, organized for the purpose of enjoying competitive but recreational slalom and giant slalom alpine racing on local southeastern Wisconsin ski area hills. Come out to any of the races one hour before the scheduled race start time to register and join us for some great ski racing. If you wish to try racing, you can register 30 to 60 minutes before a race as a TEMP Racer and race in one or two races per day, typically either Slalom or Giant Slalom races. After registration closes go the timing building at base of race course to register. Pay a small fee of $10 per race or $15 for two races in the same day and be guaranteed two runs in each race. You must sign a Liability Waiver and have a valid lift pass for the day to race. A parent must sign for a Temp that is 18-20 years of age. Juniors age 10-17 see below. You may race as a temp for as many races as you like your first season. Then you need to join a member club in subsequent seasons, to race more than 2 race dates. Your results will not count toward individual, club, or season final awards. You will not need a bib to race. Temporary Racers do not get awards or season standings. The race fees paid for racing as a Temp ($15 per day) can be applied toward the $60 Independent race fee or $50 Club race fee when you switch in the same season to an Independent or Club racer and before the fourth race day is held. you can pay a fee of $60 for your first season and participate in all races as an independent . You will race in a class appropriate for your ability.. beginner to expert. You will receive a stretch bib to wear during racing. You may race in as many races as you like your first season. Then you need to join a member club in subsequent seasons to race more than 2 race dates. you will need to join one of the member clubs to race more than 2 race dates. Last years (2017 season) Independents and Temps 18 and over need to join a MMSC club to race for more than 2 race dates, get a season standing, and awards. If you were not a Temp last season you may race all race dates as a Temp in the 2018 season. You MUST sign and have YOUR parent sign a Liability Waiver and submit it to an MMSC race representative. If you are UNDER 18 your Parent MUST be PRESENT at race or practice during your participationYou must have a valid lift pass for the day. You can choose to run as either a TEMP RACER OR INDEPENDENT RACER ... see conditions above. You can continue to race as an INDEPENDENT beyond your first year until you are old enough to join a club. Club age requirements vary between 18 and 21 years of age. you can pay a fee of $50 for the season, delivered to your club chairperson, and participate in all races for your club. You must sign a Liability Waiver and deliver to your club chairperson by late November. You must have a valid lift pass for the day to race. Your results will count toward final season standings and awards. In addition, your club pays a fee of $100 to MMSC to register the club. To download the pdf file, right click and "Save Target As"
This tri-fold can be printed both sides and folded for a distribution brochure. 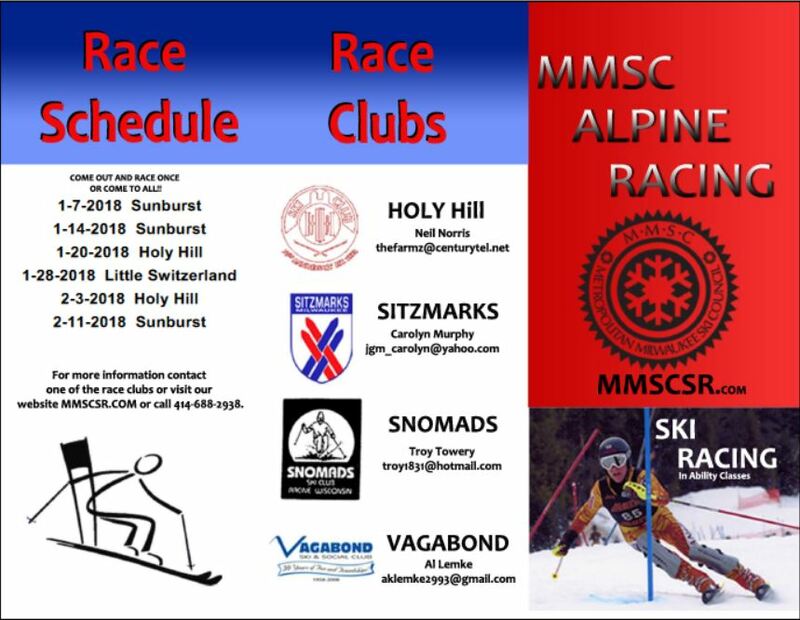 Please distribute to younger skiers that may be interested in alpine racing!